Oral Roberts is third generations Widjabal (Lismore) clan. Oral was born on the Cubawee Mission and lived there for the first 2 years of his life. The Mission was a safe place with a strong family connection to all the Bundjalung communities on the North Coast of New South Wales through the church and the teachings of Reverend Frank Roberts. Cubawee had the first Aboriginal school on the North Coast. His parents moved from Cubawee to Goonellabah where they lived the rest of their lives. His grandparents moved from Cubawee to Evands Head in 1961, he visited there many times as a child, which gave him a sense of place. He moved from Lismore in 2000 to live in Evans Head, where he lived until 2014. He now resides in Ocean Shores. Oral's work reflects his close connection to the Bundjalung land and culture. 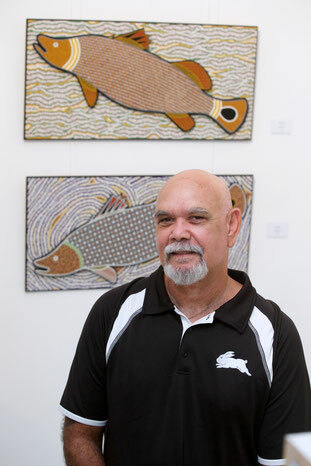 His paintings express this strong connection to spirit and the bush scrub where many of the bird species and animals he paints are native. His outstanding work continuously evolves.